This psalm is a proclamation of Jesus Christ, triumphantly approaching the eternal temple in heaven. The question is, “Who can ascend the hill of the LORD? And who can stand in his holy place?” Of course, the answer is, “those who have clean hands and a pure heart…” And who is that? Who has clean hands and a pure heart? No mere mortal. No sinful human being. The psalm then, is a dialogue as heavenly beings question, “Who is this approaching the heavenly gates?” And the psalmist answers, “Open up, and you’ll see! The King of glory will come in — and the King of glory is Jesus Christ, King of kings and Lord of lords — Jesus, who by his death, resurrection and exaltation is LORD of the hosts of heaven!” It is right that the everlasting doors of heaven should be opened for the Lord Jesus Christ, strong and mighty! This psalm also calls on the kings of this world, all nations and peoples to open the “doors” of their hearts, homes and kingdoms, as well, to welcome the King of glory, the Lord of hosts. The prayer of Advent is, “Come, Lord Jesus!” Let us open ourselves and our lives to his coming! 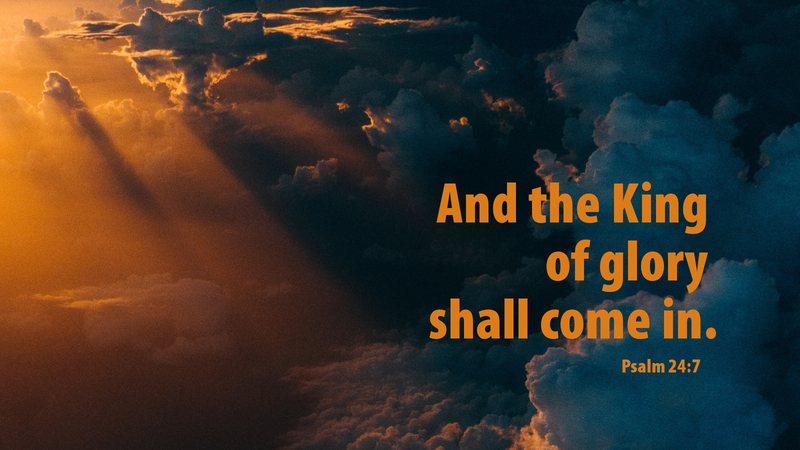 Prayer: O Lord of Hosts, you are King of glory! Thank you for your birth at Bethlehem, to be the savior and redeemer of the world — and of me! Amen. Advent Action: Begin the season of Advent by joining in Sunday worship! Thank you for making this available. This is my third year receiving the devotions on my cell phone and I love it! !